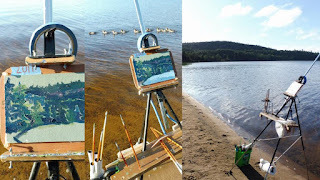 Phil Chadwick's Art: #2011 "Algonquin Rock Lake Eastern Ridges"
#2011 "Algonquin Rock Lake Eastern Ridges"
After completing #2010 "Algonquin Rock Lake Sunrise" I turned my easel back to look upon the dark and cliffed eastern shore of Rock Lake. The sun was just clearing the forested slope but not enough that I was blinded by the light. There were some stabs of colour on the shore. The black ducks were still around as well as the hunting party of common mergansers. I was not alone. This small and very rough panel posed some challenges but nothing a bit more paint couldn't solve.